1. Preheat your oven to 400℉. 2. If you're opting for spicy, add your nuts to a skillet with a tiny bit of cooking oil on medium heat. Sprinkle with a pinch of Perfection Spice Rub or WhoopAss and toast on low for a few minutes. If you're not adding spice, you can leave these un-toasted or toast without spice for a few moments for a nuttier flavor. 3. When nuts have cooled, stuff your dates each with a nut. 4. In a bowl, combine flour, rosemary, cheese, salt, and if using, Shepherd Herb Mix. A tablespoon at a time, add in the melted ghee or butter and water, mixing as you add them to form a dough that's slightly crumbly yet still holds together when you form it into a ball. 5. Divide the dough into 12 equal pieces. Form each into a ball, then flatten. Fill each with a date and wrap the dough around each, working to cover any cracks and ensuring the thickness is even all around. Roll them between your hands to smooth. 4. Bake at 400℉ on a baking sheet lined with parchment paper, flipping halfway through, for about 20 minutes. Serve warm, or slightly heat before serving. Boil about 2 cups of water. In another pot, heat the coconut milk and honey on medium heat. In a bowl, whisk the vanilla, Garam masala and eggs. Once the milk/honey is heated, add it to the egg mixture and mix well. Place 4 ramekins in a baking dish and fill the baking dish to half full with the hot water. Pour the custard mixture into the ramekins. Bake for 25-35 minutes or until the custard feels set. Serve warm or refrigerate for at least 2 hours to chill. 1. Add a tiny bit of oil to an oven-safe skillet and bring to medium heat. 2. Add trail mix, shaking to coat very lightly with oil, sprinkle in spice, pour in the soy sauce or coconut aminos, shaking the pan to coat, then sprinkle in the sugar to dust the mix. 3. Place in the oven at 200℉ for 15-20 minutes, remove, and let cool. 1. Slice off the ends off the squash, slice in half and scoop out the seeds. Bake, skin on, until browning in 450℉ oven. 2. Meanwhile, in a skillet, sautéed the diced celery and onion until soft, sprinkling with salt and herbs. Set aside. 3. In a skillet, add a little cooking oil then add the ground turkey. Cook, chopping with a fork, sprinkling with a tablespoon of spices and salt to taste. 4. When all components are finished cooking, layer a bowl with squash, add a scoop of the celery onion mix, then top with ground herbed turkey. 5. Finally, sprinkle cranberries and pecans and drizzle with tahini and honey/maple to serve. 1. In a large sauce pan or frying pan, add coconut oil and melt on low. Add in chocolate, stirring so as not to burn, then pour in honey and mix very well until ingredients are thoroughly combined. 3. Add coffee and Garam Masala to the chocolate and stir. 4. Pour the mixture over the nut/fruit sprinkle, making sure there are no holes or gaps. You can spread it all around a bit with a spatula. If you didn't add nuts/fruit to the pan first, just pour chocolate into a sheet, then sprinkle with nut/fruit mixture. 5. I like to sprinkle everything with a coating of coconut sugar at the end if chocolate it still bitter. 6. Freeze for a few hours, then break into pieces for serving. Store in freezer. 1. Slice off the ends of the pumpkin, slice in half, scoop out the seeds, and bake with skin on until softened at 450℉. 2. Carefully remove the skin. 3. Add flesh to your blender. 4. Heat oil in a large skillet then toss in garlic. Once aromatic, toss in apples, salt, and Massaman Curry. 5. Cook until onions are softened then transfer everything to the blender. 6. Deglaze the pan with a bit of the broth and pour contents into the blender. 7. Add broth and coconut milk to the blender. 8. Blend ingredients until creamy and thoroughly combined. Adjust spice and salt as needed. 1. Fry bacon and set aside to cool. 2. In the bacon grease, fry thin sliced apples for about 30 seconds on each side and set aside. 3. Add chopped pecans to the grease and simmer, shaking in some spice and a teaspoon of honey to coat (add a pinch of salt here too!). Let cook on medium for about a minute then scoop out with a fork. 4. You can finish the bacon in the honey spice grease to add a little extra flavor. 5. Combine all ingredients for the dressing in a small container. 6. Mix all ingredients together and drizzle with dressing to serve. 1. Begin by preparing the sausage, cooking it through. 2. Slice the peppers and onion into long strips, mince the garlic, then heat some oil in a large pot. 3. Add garlic, onion and peppers and cook over medium, stirring regularly until mostly softened. 4. Add the crushed tomato, spice and salt. Taste and adjust seasoning as necessary. 5. Add sausage links and serve. 1. In a blender, blend ½ the cucumbers with all of the water until smooth. 2. Add remaining cucumber, onion, garlic, basil, honey, vinegar, Shepherd Herb Mix, and blend until smooth. 3. With blender on, slowly add the oil and blend until creamy. 5. Chill for a few hours before serving. 2. Dice the vegetables and toss with olive oil and a good pinch of salt. 3. Whisk eggs with spice, add in veggies and mix welll. 3. Pour contents into a greased pie dish or cast iron skillet. 4. Bake at 425℉ for 20-30 minutes until firm. If the center is still wet, turn the broiler on low and cook for one more minute until the center is set. 1. Preheat oven to 350℉. Combine dry ingredients in one bowl, wet in another and then mix together to form a ball of dough. 2. On a baking sheet, roll out the dough ball in between 2 pieces of parchment paper. 3. Peel off the top layer of parchment and bake crust for 10 minutes. 4. Let crust cool for 5 minutes, then spread the pesto or mayo evenly on crust. 6. Grate some fresh parmesan over top. 8. Remove from oven and sprinkle on more chopped basil to finish. 1. Add steak slices to a Ziploc bag or large storage container with lid. 2. Add all ingredients minus 1 tsp of honey, and stir to coat. 3. Zip or put the lid on the container and shake well. Marinate for a few hours in the fridge. 4. When ready to cook, add 1-2 tsp ghee or cooking oil to a pan (cast iron if possible) then add the steak strips when hot. 5. Cook until steak is cooked through. You can add remaining marinade/spice while cooking. As liquid thickens and steak finishes cooking, turn up the heat to high and get some nice browning on the steak. Add a drizzle of honey and one splash of coconut aminos or soy sauce to finish. 6. Serve atop rice or sauteed vegetables. 1. Rinse and drain liquid from chickpeas and let sit on a towel for about 30-60 minutes. Pat dry. 2. Heat oven to 400℉. Toss chickpeas in a little oil, spice, and salt, then bake for about 30-45 minutes until crispy. 3. Meanwhile, heat the grill and cover eggplant with a little oil and salt. Place directly on the grill, puncturing with a few holes and grill for about 20 minutes, flipping regularly. If you don't want to use a grill, you can roast them until softened. 4. Take a moment and bring a dry skillet to medium heat. Toss in the sesame seeds and slightly brown them. 5. When eggplant is tender, remove from the grill, slice open like a baked potato, fill each with half the chickpeas, a pinch of salt, then tahini, and top with the toasted sesame seeds and remaining chickpeas. 1. Begin by chopping the berries into a small dice. Toss with sugar and let sit for 20 minutes to a few hours. 2. Pour the berries + sugar into a pan on the stove top and bring to medium-high heat, stirring regularly. Add lemon and spice. 3. The berries will cook down so continue to stir and bring to a boil. Cook for 20-40 minutes. To test, pour a little on a spoon and drag your finger through it. If it doesn't fall back onto itself, it's done. If it does, continue to reduce. Your jam should thicken, and if desired, you can use a potato masher or fork to break the berries down even further as they cook. 4. Once reduced/thickened, add to a glass jar and let cool slightly before covering. Refrigerate and enjoy on toast, crackers, pastries, even burgers or roasted meats as a glaze! You'll be amazed at how good this flavor combo can be. 1. Begin by chopping onion and pepper in a food processor. 2. Heat 1-2 teaspoons of sesame oil in a cast iron skillet. 3. Mix salmon, onion, pepper, salt, spice, garlic, and the egg in a bowl. Slowly add flour, a tablespoon at a time until no long super wet and holds when put into a patty. 4. Make a patty using about 2 Tbsp worth of the mix, forming in your hands, and then place carefully in the hot oil. 5. Continue with the rest of the mixture, adding to the oil (you may need to do 2-3 batches). 6. Fry on medium high for about 2-3 minutes then check to see if ready to flip. Flip when turning golden brown, and fry to desired doneness on the other side. You can slightly press with a spatula after the first flip. 7. Serve with your favorite sauce, or add to a salad and enjoy. 1. Preheat oven to 400℉. 2. Begin by washing carrots. Chop them in half lengthwise, then cut those pieces in half horizontally, making carrot "sticks"
3. Chop the ends of the onion off, then cut in half horizontally. Cut those pieces into half, horizontally. Then peel. Remove the onion in layers, and place over carrots on a greased baking sheet. 4. Coat the carrots and onion with olive oil, 1 Tbs Harissa, and a pinch of salt. 5. Bake for 30 minutes, flipping halfway. 6. Drizzle with honey, bake for 5 more minutes, then serve. 1. If grilling, preheat the grill to medium heat. 2. Chop garlic, onion, and potatoes. 3. Add half the garlic to a warm skillet/cast iron pan, with some fat or oil of choice. After a few minutes, add potatoes and cook over medium heat. 4. Add salt to potatoes and a pinch of your favorite spice (we love to use our Montreal blend!) Stir the potatoes regularly. Add green onion/leeks in when about halfway cooked through. 5. Mix Perfection Spice, the other half of the garlic, a pinch of salt, and half of the chopped leeks/onions in a small bowl. 6. Add ground beef to the mixture and mix well. Patty into 4 burgers. Cook until the desired doneness. 7. When burger and potatoes are done, top the potatoes with the patty and serve. 8. Up the ante by mixing up a garlic mayo for topping! 1. Begin by cutting off any excess film around the ribs. 2. Turn on grill to medium heat (Please see notes for oven cooking). 3. Purée the cherries with tomato paste, dates, spice, vinegar, and a pinch of salt. Taste and adjust as needed. 4. Lightly coat the ribs in the paste, then wrap well, folding in the ends to create a foil bag around the ribs. Save remaining paste. 5. Place on grill over low heat for about 15 minutes, then flip carefully, taking caution as to not puncture the bag. Cook for another 15 minutes. Repeat process to cook for 1 hour in foil. 6. Open the bag, carefully, then place the ribs directly over low heat, brushing additional paste over the ribs, flipping every 5 minutes or so, continuing with the paste, until the temperature has reached about 190℉. 7. Serve with your favorite side dish. 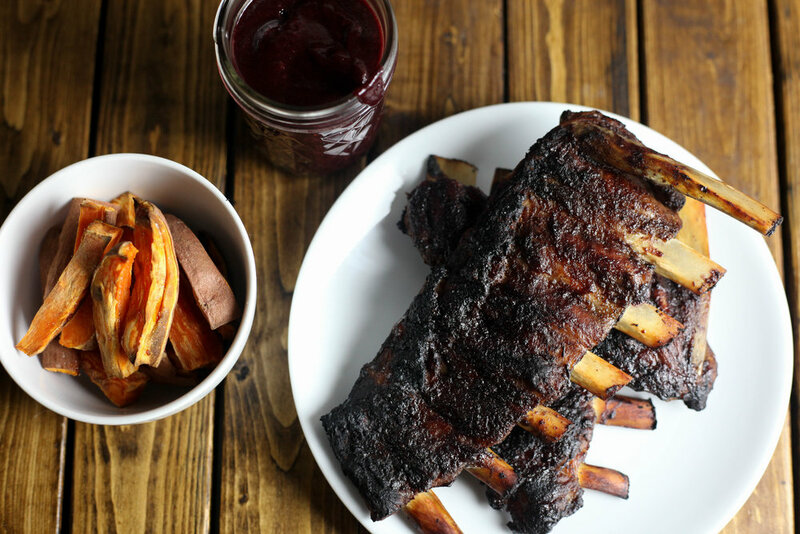 *We made these specifically on the grill but a general spare rib recipe in the oven calls for ribs to be cooked about 3-4 hours at 275℉, in a large roasting pan covered with aluminum foil. 1. Preheat oven to 400 degrees or heat grill. 2. Dice chicken into bite size pieces. 3. In a bowl, mix spice, salt, honey, and oil. 4. Add chicken to bowl to coat. 5. Slide chicken onto metal skewers. If baking, lay across a casserole dish so drippings won't fall into the bottom of your oven and burn. 6. Bake for 25 minutes or until cooked through and broil for a moment to finish slightly crispy. Likewise, grill until chicken is no longer pink. 1. Begin by mashing the beans with a fork until mostly ground up. 2. Using a food processor or grater, chop all veggies to an ultra fine size. 3. Mix veggies and beans, then add eggs, stirring well. 4. Add salt, spice, garlic, and then begin to add flour, a tablespoon at a time. Stop if the mixture becomes too thick and dry, you want it to stay somewhat moist but not overly wet. 5. Scoop with 1/3 cup and then patty with your hands. Lay each burger on a very well greased baking sheet or Silpat mat. 6. Bake at 350 for 45-60 minutes, flipping carefully halfway.